Treat your feet to a spa-like experience, right at home. Made in the USA, the FootMate System is a safe and effective way to cleanse, exfoliate, and massage your feet. Thanks to suction cups that secure it to the floor or tub, there’s no need to even bend over. The surface is also anti-skid, anti-mildew, and stain-resistant. Dimensions (in packaging): 13" x 10" x 3"
It works great! I like it! The FootMate System is a safe, stable way to cleanse and massage your feet without risking a fall. What’s unique about this Made in the USA, foot bath massager is the suction cups that keep the scrubber in place. On the floor or in the tub, it stays securely put. The surface is also anti-skid, anti-mildew, and stain-resistant. 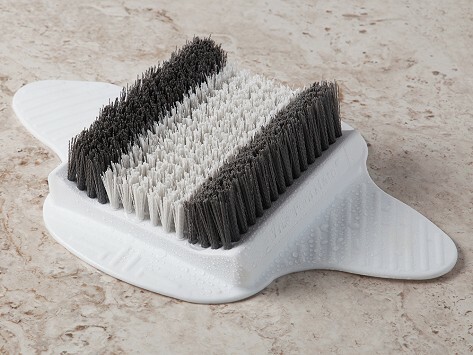 Soft inner bristles gently massage your skin while the stiffer outer bristles buff away rough, dry patches. The system's Rejuvenating Gel is packed with tea tree oil and Vitamin E, which cleanses and conditions your skin. With just a few gentle back and forth movements, your feet are clean and feeling refreshed—without any bending or stooping. If you’re looking to boost circulation or simply give your tired feet a treat, the FootMate is a safe and easy way to improve your overall foot health.